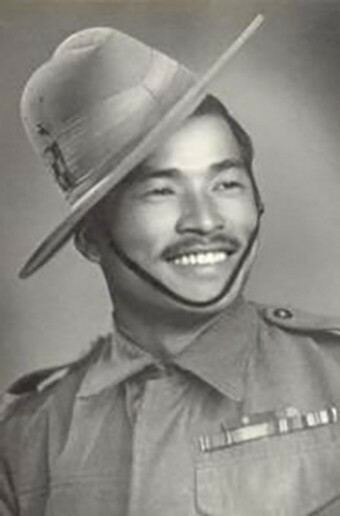 Bhanbhagta Gurung was awarded the Victoria Cross or VC, Britain’s highest military award although he had been demoted due to the incompetence of a senior officer. The British could not spell his name correctly or pronounce it properly. In his VC citation, his name is written as “Bhan-bhag-ta,” while on other records it is “Bha-nu-bhag-ta.” Neither is correct. In the Devanagari script, his name is भनभक्त, and fortunately, this writer is literate in the Devanagari script! The proper Roman transliteration is “Bha-na-bhak-ta,” which roughly translates as “devotee who professes.” However, most Nepali and Hindi speakers pronounce it as “Bhan-bhak-ta,” so it is easy to see how people got it wrong. Gurung was born in September 1921 – there is no record of the actual date – in the hill village of Phalpu in western Nepal’s Gorkha district. In 1939, the 18-year-old joined the British Indian Army and was assigned to the 3rd Battalion, 2nd King Edward VII’s Own Gurkha Rifles (The Sirmoor Rifles). To understand how he enlisted in the British Indian Army, it is necessary to explain what a Gurkha is. In the 1800s, the British East India Company tried to invade the Gorkha region and were humiliated despite having superior weaponry. The Victorians deemed the soldiers of Gorkha (the Gurkhas) as a “martial race” and felt a grudging admiration for them. In 1815, they signed a peace treaty that lasts to this day. Every year since then, the British government recruits Gurkhas in Nepal who help to bolster British military forces around the world. 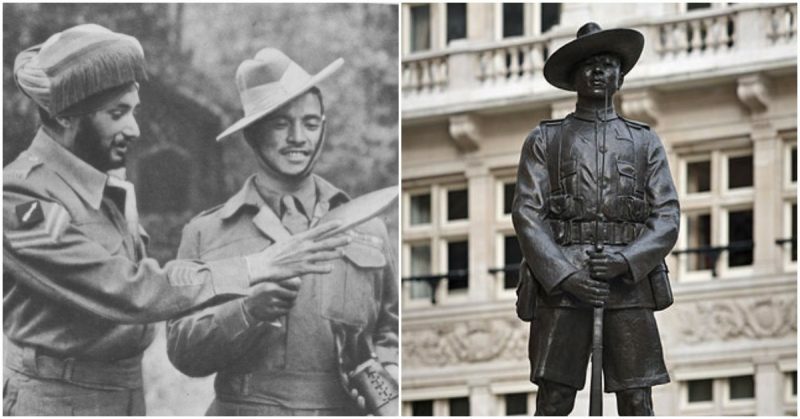 As a result, Gurkhas have played a role in virtually every British military operation, including both world wars. Gurung did well and was promoted to the rank of Lance Naik (Lance Corporal). In 1942 Burma sided with Japan in an attempt to kick the British out. In reality, Burma became a Japanese puppet state. As a result, Burma split into three warring factions – those who supported Japan, those who preferred the British, and those who wanted neither. The British exploited those divisions by sending in the Chindits (after the Burmese Chinthe, mythical guardians of Buddhist temples). Among them was the 3rd Battalion, 2nd Gurkha Rifles including Gurung. Despite coming from warrior stock, it was not easy. What the Japanese failed to do, Burma’s tropical climate and poor logistics on the part of the British did. They lacked food, medicine, and ammo due to failed supply drops. Malaria and dysentery were rampant. ‘Scraggy Hill’ which was captured by 10th Gurkha rifles in fierce fighting in the Shenam area during the Battle of Imphal. The first group of Chindits entered Burma on February 8, 1943, in several columns – Operation Longcloth had begun. Unfortunately, poor communication lines and constantly changing orders did not help. The Chindits managed to blow up a few railway lines, but that was all. By the end of April, only 2,182 of the original 3,000 returned to British India. Of them, 600 were so ill they could not return to active duty. In March 1944 Gurung was back in Burma with the 25th Indian Division. There he distinguished himself while fighting in the Mayu Range; earning himself a promotion to the rank of Naik (Corporal). Shortly after, his platoon commander ordered him to take a hill – which he did. Unfortunately, it was the wrong hill. The battalion commander was furious, so Gurung was blamed and demoted to protect his superior officer. In February 1945, the 14th Army launched a major offensive into Burma to take the important cities of Meiktila and Mandalay. 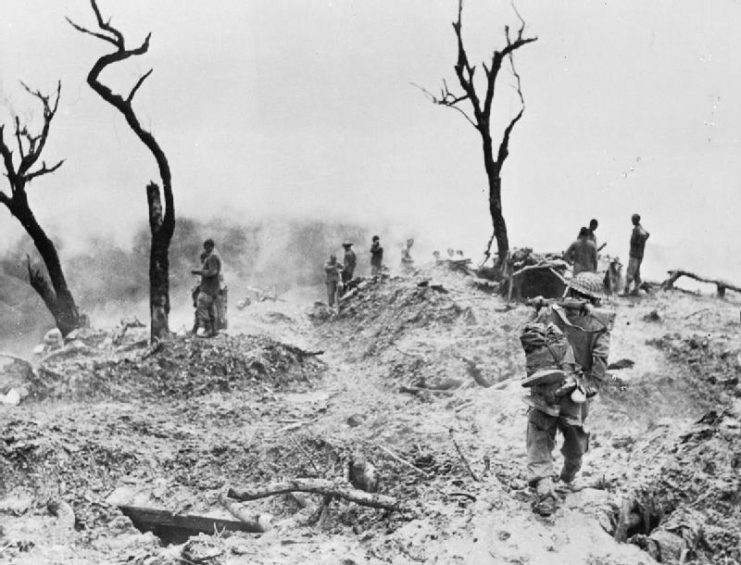 To provide a diversion and keep the Japanese guessing as to where they were headed, the 25th entered the Irrawaddy through the An Pass and took two hills (Snowdon and Snowdon East) before being repelled by the Japanese. 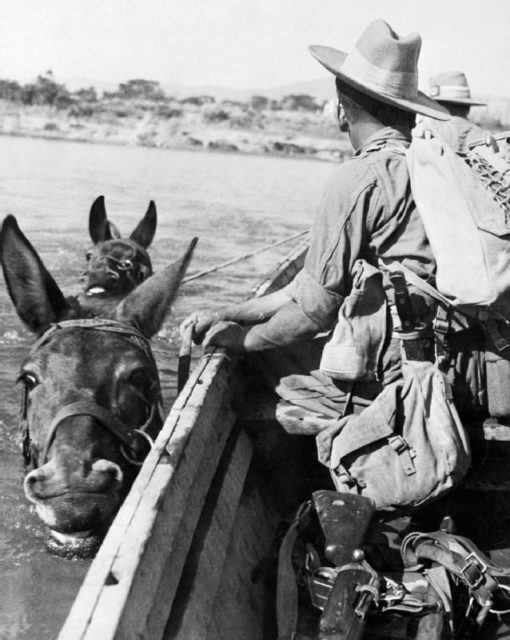 Gurkhas hold onto their mules as they swim across the Irrawaddy River during the advance towards Mandalay, January 1945. On March 5 they were ordered to retake them at all costs. Both hills were occupied by the Japanese 54th Division who pinned down Gurung’s company and wiped out half of them. The survivors threw themselves to the ground while a Japanese sniper picked them off. Gurung did the only thing he could. He stood up in full view of the sniper and calmly took a shot at him and killed him. Advancing further they were again pinned down, so Gurung charged the nearest fox-hole without waiting for his men. Despite the hail of bullets, he chucked in two grenades killing two Japanese soldiers. Then he attacked a second fox-hole where he killed the occupants with his bayonet. Under continuous machine-gun fire he attacked and took out the occupants of two more fox-holes with his bayonet and grenades. The machine-gun fire was coming from a concrete bunker, so he made a final dash toward it and leaped onto the roof. Having no grenades left he threw in two smoke grenades. Two Japanese soldiers ran out blinded by the smoke and Gurung killed them with his kukri blade. He then entered the bunker and dispatched the remaining soldier. With his unit in control of the five positions, they held their ground until reinforcements arrived. Gurung received his VC from King George VI. He regained his former rank of Naik and also earned the rank of Honorary Havildar. After the war, he returned to his family in Nepal.